This study test will help you learn the highway code road signs and traffic signals. There are 156 questions from the DVSA revision question bank and each includes explanatory text alongside it to help you learn. An excellent study resource we highly recommend is Know Your Traffic Signs which contains all highway code signs. The average score for this road signs test is 85%. Can you beat that? The priority through the junction is shown by the broader line. You need to be aware of the hazard posed by traffic crossing or pulling out onto a major road. You will see this sign if there has been an incident ahead and the motorway is closed. You MUST obey the sign. Make sure that you prepare to leave as soon as you see the warning sign. Don’t pull over at the last moment or cut across other traffic. This sign means that traffic can only travel in one direction. The others show different priorities on a two-way road. This sign will give you an early warning that the road ahead will slope downhill. Prepare to alter your speed and gear. Looking at the sign from left to right will show you whether the road slopes uphill or downhill. Knowing the colours of the reflective studs on the road will help you judge your position, especially at night, in foggy conditions or when visibility is poor. Even though you have priority, be prepared to give way if other drivers don’t. This will help to avoid congestion, confrontation or even a collision. This sign is found where a shallow stream crosses the road. Heavy rainfall could increase the flow of water. If the water looks too deep or the stream has spread over a large distance, stop and find another route. If you intend to take a left turn, this sign shows you that you can’t get through to another route using the left-turn junction ahead. You may cross the solid white line to pass a stationary vehicle, pedal cycle, horse or road maintenance vehicle if they are travelling at 10 mph or less. You may also cross the solid line to enter into a side road or access a property. Don’t force your way through. Show courtesy and consideration to other road users. Although you have priority, make sure oncoming traffic is going to give way before you continue. In some situations drivers may need to give arm signals, in addition to indicators, to make their intentions clear. For arm signals to be effective, all road users should know their meaning. These markings show the direction in which the traffic should go at a mini-roundabout. Sometimes work is carried out on the motorway without closing the lanes. When this happens, signs are mounted on the back of lorries to warn other road users of roadworks ahead. If a vehicle displaying this sign is in your lane you will have to pass it on the left. Use your mirrors and signal. When it’s safe move into the lane on your left. You should always look well ahead so that you can spot any hazards early, giving yourself time to react safely. You’ll see this sign if the motorway is closed ahead. Pull into the nearside lane as soon as it is safe to do so. Don’t leave it to the last moment. This sign is in place to ensure a clear route for traffic. Don’t stop except in an emergency. The STOP sign is the only road sign that is octagonal. This is so that it can be recognised and obeyed even if it is obscured, for example by snow. Stopping where this clearway restriction applies is likely to cause congestion. Allow the traffic to flow by obeying the signs. There might be an occasion where another driver uses an arm signal. This may be because the vehicle's indicators are obscured by other traffic. In order for such signals to be effective, all drivers should know their meaning. Be aware that the 'left turn' signal might look similar to the 'slowing down' signal. Flashing red lights above your lane show that your lane is closed. You should move into another lane as soon as you can do so safely. In a one-way system traffic may be passing you on either side. Always be aware of all traffic signs and understand their meaning. Look well ahead and react to them in good time. At night or in poor visibility reflective studs on the road help you to judge your position on the carriageway. A warning sign with a picture of a windsock will indicate there may be strong crosswinds. This sign is often found on exposed roads. In a contraflow lane the traffic permitted to use it travels in the opposite direction to traffic in the other lanes on the road. You must obey signals given by the police. If a police officer in a patrol vehicle wants you to pull over they will indicate this without causing danger to you or other traffic. Look well ahead and check the pavements and surrounding areas for pedestrians. Look for anyone walking towards the crossing. Check your mirrors for traffic behind, in case you have to slow down or stop. The approach to, and exit from, a pedestrian crossing is marked with zigzag lines. You must not park on them or overtake the leading vehicle when approaching the crossing. Parking here would block the view for pedestrians and the approaching traffic. Where you see this road marking you should give way to traffic on the main road. It might not be used at junctions where there is relatively little traffic. However, if there is a double broken line across the junction the ‘give way’ rules still apply. When you leave the motorway make sure that you check your speedometer. You may be going faster than you realise. Slow down and look out for speed limit signs. Warning signs are there to make you aware of potential hazards on the road ahead. Take note of the signs so you're prepared and can take whatever action is necessary. Other warning signs are the same shape and colour, but the ‘give way’ sign triangle points downwards. When you see this sign you MUST give way to traffic on the road which you are about to enter. Urban clearways are provided to keep traffic flowing at busy times. You may stop only briefly to set down or pick up passengers. Times of operation will vary from place to place so always check the signs. At schools you should not stop on yellow zigzag lines for any length of time, not even to set down or pick up children or other passengers. These signals are found at level crossings, swing or lifting bridges, some airfields and emergency access sites. The flashing red lights mean stop whether or not the way seems to be clear. This sign is there to alert you to the likelihood of danger ahead. It may be accompanied by a plate indicating the type of hazard. Be ready to reduce your speed and take avoiding action. It is important to know and obey temporary signs on the motorway: they are there for a reason. You may not be able to see the hazard straight away, as the signs give warnings well in advance, due to the speed of traffic on the motorway. You should be careful in these locations as the road surface is likely to be wet and slippery. There may be a steep drop to the water, and there may not be a barrier along the edge of the road. You should know the speed limit for the road on which you are travelling, and the vehicle that you are driving. The different speed limits are shown in The Highway Code. If you’re overtaking make sure you move back safely into the left-hand lane before you reach the end of the dual carriageway. There will also be markings on the road surface to indicate the bus lane. You must not use this lane for parking or overtaking. The white light shows that trams must stop, but the green light shows that other vehicles may go if the way is clear. You may not live in an area where there are trams but you should still learn the signs. You never know when you may go to a town with trams. 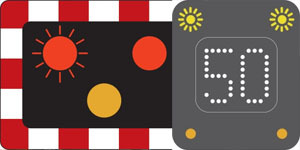 Temporary restrictions on motorways are shown on signs which have flashing amber lights. At the end of the restriction you will see this sign without any flashing lights. When there’s queuing traffic ahead and you have to slow down or even stop, showing your hazard warning lights will alert following traffic to the hazard. Don’t forget to switch them off as the queue forms behind you. Where there’s a long, steep, uphill gradient on a motorway, a crawler lane may be provided. This helps the traffic to flow by diverting the slower heavy vehicles into a dedicated lane on the left. Leaving your indicators on could confuse other road users and may even lead to a crash. Be aware that if you haven’t taken a sharp turn your indicators may not self- cancel and you will need to turn them off manually. Yellow ‘box junctions’ like this are often used where it’s busy. Their purpose is to keep the junction clear for crossing traffic. Don’t enter the painted area unless your exit is clear. The exception to this is when you are turning right and are only prevented from doing so by oncoming traffic or by other vehicles waiting to turn right. Clearways are stretches of road where you aren’t allowed to stop unless in an emergency. You’ll see this sign. Stopping where these restrictions apply may be dangerous and likely to cause an obstruction. Restrictions might apply for several miles and this may be indicated on the sign. Look out for traffic signs. Disobeying or not seeing a sign could be dangerous. It may also be an offence for which you could be prosecuted. Slow down as you approach the roundabout and check for traffic from the right. If you need to stop and give way, stay behind the broken line until it is safe to emerge onto the roundabout. When a diversion route has been put in place, drivers are advised to follow a symbol which may be a triangle, square, circle or diamond shape on a yellow background. Look out for signs above your lane or on the central reservation. These will give you important information or warnings about the road ahead. Due to the high speed of motorway traffic these signs may light up some distance from any hazard. Don’t ignore the signs just because the road looks clear to you. You would generally see this sign at the approach to a pedestrian-only zone. If you’re in places where there are likely to be pedestrians such as outside schools, near parks, residential areas and shopping areas, you should be extra-cautious and keep your speed down. Many local authorities have taken measures to slow traffic down by creating traffic calming measures such as speed humps. They are there for a reason; slow down. You need to signal to let other drivers know your intentions. However, if you indicate too early they may think you are turning left into the junction. Correct timing of the signal is very important to avoid misleading others. Be prepared for traffic approaching from junctions on either side of you. Try to avoid unnecessary changing of lanes just before the junction. Where traffic lights are out of order you might see this sign. Proceed with caution as nobody has priority at the junction. When you pass pedestrians in the road, leave plenty of room. You might have to use the right-hand side of the road, so look well ahead, as well as in your mirrors, before pulling out. Take great care if there is a bend in the road obscuring your view ahead. If the road has two lanes you can use either lane and overtake on either side. Use the lane that’s more convenient for your destination unless signs or road markings indicate otherwise. These signs are often seen in one-way streets that have more than one lane. When you see this sign, use the route that’s the most convenient and doesn’t require a late change of direction. If your view is restricted at a road junction you must stop. There may also be a ‘stop’ sign. Don’t emerge until you’re sure there’s no traffic approaching. IF YOU DON’T KNOW, DON’T GO. In some built-up areas, you may find the speed limit reduced to 20 mph. Driving at a slower speed will help give you the time and space to see and deal safely with hazards such as pedestrians and parked cars. You should move into the lanes as directed by the sign. Here the right-hand lane is closed and the left-hand and centre lanes are available. Merging in turn is recommended when it’s safe and traffic is going slowly, for example at road works or a road traffic incident. When vehicles are travelling at speed this is not advisable and you should move into the appropriate lane in good time. You must pull up on the left as soon as it’s safe to do so and switch off your engine. This type of sign will warn you of hazards ahead. Make sure you look at each sign and road markings that you pass, so that you do not miss any vital instructions or information. This particular sign shows there is a T-junction with priority over vehicles from the right. A continuous white line is used on many roads to indicate the edge of the carriageway. This can be useful when visibility is restricted. The line is discontinued at junctions, lay-bys and entrances and exits from private drives. When amber is showing on its own red will appear next. The amber light means STOP, unless you have already crossed the stop line or you are so close to it that pulling up might cause a collision. You MUST always obey red flashing stop lights. If a train passes but the lights continue to flash, another train will be passing soon. Cross only when the lights go off and the barriers open. Priority signs are normally shown where the road is narrow and there isn’t enough room for two vehicles to pass. These can be at narrow bridges, road works and where there’s a width restriction. Make sure that you know who has priority, don’t force your way through. Show courtesy and consideration to other road users. In some situations you may feel your indicators cannot be seen by other road users. If you think you need to make your intention more clearly seen, give the arm signal shown in The Highway Code. Road signs in the shape of a circle give orders. Those with a red circle are mostly prohibitive. The ‘stop’ sign is octagonal to give it greater prominence. Signs giving orders MUST always be obeyed. When stationary only sound your horn if you think there is a risk of danger from another road user. Don’t use it just to attract someone’s attention. This causes unnecessary noise and could be misleading. To ease the congestion in town centres, some cities and towns provide park-and- ride schemes. These allow you to park in a designated area and ride by bus into the centre. Park-and-ride schemes are usually cheaper and easier than car parking in the town centre. Where there’s a cycle route ahead, a sign will show a bicycle in a red warning triangle. Watch out for children on bicycles and cyclists rejoining the main road. The white line is generally positioned so that pedestrians have room to cross in front of waiting traffic. Don’t move off while pedestrians are crossing, even if the lights change to green. You need to know the difference between the normal centre line and a hazard warning line. If there is a hazard ahead, the markings are longer and the gaps shorter. This gives you advanced warning of an unspecified hazard ahead. Where you see this sign the 20 mph restriction ends. Check all around for possible hazards and only increase your speed if it’s safe to do so. It will take up to ten times longer to stop when it’s icy. Where there is a risk of icy conditions you need to be aware of this and take extra care. If you think the road may be icy, don’t brake or steer harshly as your tyres could lose their grip on the road. Road markings will warn you of a hazard ahead. A single, broken line along the centre of the road, with long markings and short gaps, is a hazard warning line. Don’t cross it unless you can see that the road is clear well ahead. Look well ahead and be ready to stop for any pedestrians crossing, or about to cross, the road. Also check the pavements for anyone who looks like they might step or run into the road. There are three basic types of traffic sign, those that, warn, inform or give orders. Generally, triangular signs warn, rectangular ones give information or directions, and circular signs usually give orders. An exception is the eight-sided ‘STOP’ sign. This sign is shown where slow-moving vehicles would impede the flow of traffic, for example in tunnels. However, if you need to slow down or even stop to avoid an incident or potential collision, you should do so. You MUST NOT enter a box junction until your exit road or lane is clear. The exception to this is if you want to turn right and are only prevented from doing so by oncoming traffic or by other vehicles waiting to turn right. The triangular shapes above and below the dimensions indicate a height restriction that applies to the road ahead. At junctions controlled by traffic lights you must stop behind the white line until the lights change to green. Red and amber lights showing together also mean stop. You may proceed when the light is green unless your exit road is blocked or pedestrians are crossing in front of you. If you’re approaching traffic lights that are visible from a distance and the light has been green for some time they are likely to change. Be ready to slow down and stop. This sign is found at the entrance to a road that can only be used for access. The ‘no right turn’ sign may be used to warn road users that there is a ‘no entry’ prohibition on a road to the right ahead. Areas of ‘hatched markings’ such as these are to separate traffic streams which could be a danger to each other. They are often seen on bends or where the road becomes narrow. If the area is bordered by a solid white line, you must not enter it except in an emergency. This sign may be at the end of a dual carriageway or a one-way street. It is there to warn you of oncoming traffic. Before you set out on your journey use a road map to plan your route. When you see advance warning of your junction, make sure you get into the correct lane in plenty of time. Last-minute harsh braking and cutting across lanes at speed is extremely hazardous. You should stay in the left-hand lane of a motorway unless overtaking. The right- hand lane of a motorway is an overtaking lane and not a ‘fast lane’. After overtaking, move back to the left when it is safe to do so. A long white line with short gaps means that you are approaching a hazard. If you do need to cross it, make sure that the road is clear well ahead. Some crossings have gates but no attendant or signals. You should, stop, look both ways, listen and make sure that there is no train approaching. If there is a telephone, contact the signal operator to make sure that it’s safe to cross. You need to be aware of the various signs that relate to pedestrians. Some of the signs look similar but have very different meanings. Make sure you know what they all mean and be ready for any potential hazard. You will need to slow down. At humpback bridges your view ahead will be restricted and the road will often be narrow on the bridge. If the bridge is very steep or your view is restricted sound your horn to warn others of your approach. Going too fast over the bridge is highly dangerous to other road users and could even cause your wheels to leave the road, with a resulting loss of control. If you’re behind a slow-moving vehicle be patient. Wait until the restriction no longer applies and you can overtake safely. Other road users may give misleading signals. When you’re waiting at a junction don’t emerge until you’re sure of their intentions. Signs in the shape of a circle give orders. A sign with a red circle means that you aren’t allowed to do something. Study Know Your Traffic Signs to ensure that you understand what the different traffic signs mean. Take extra care when you encounter trams. Look out for road markings and signs that alert you to them. Modern trams are very quiet and you may not hear them approaching. This sign warns you to beware of trams. If you don’t usually drive in a town where there are trams, remember to look out for them at junctions and look for tram rails, signs and signals. When you see this sign, look out for any direction signs and judge whether you need to signal your intentions. Do this in good time so that other road users approaching the roundabout know what you’re planning to do. There will be a plate or additional sign to tell you when the restrictions apply. Even though you have left the restricted area, make sure that you park where you won’t endanger other road users or cause an obstruction. Signs with a brown background give directions to places of interest. They will often be seen on a motorway directing you along the easiest route to the attraction. In the interests of road safety, temporary speed limits are imposed at all major road works. Signs like this, giving advanced warning of the speed limit, are normally placed about three quarters of a mile ahead of where the speed limit comes into force. If you know which light is going to show next you can plan your approach accordingly. This can help prevent excessive braking or hesitation at the junction. If you’re travelling on a dual carriageway that becomes a single carriageway road, reduce your speed gradually so that you aren’t exceeding the limit as you enter. There might not be a sign to remind you of the limit, so make sure you know what the speed limits are for different types of roads and vehicles. These have been put in place to slow the traffic down. They’re usually found in residential areas. Slow down to an appropriate speed. There may be occasions when drivers need to give an arm signal to confirm an indicator. This could include, in bright sunshine, at a complex road layout, when stopping at a pedestrian crossing or when turning right just after passing a parked vehicle. You should understand what each arm signal means. If you give arm signals, make them clear, correct and decisive. Obey the ‘give way’ signs. Trams are unable to steer around you if you misjudge when it is safe to enter the junction. Never sound the horn aggressively. You MUST NOT sound it when driving in a built- up area between 11.30 pm and 7.00 am or when you are stationary, an exception to this is when another road user poses a danger. Do not scare animals by sounding your horn. When approaching a tunnel switch on your dipped headlights. Be aware that your eyes might need to adjust to the sudden darkness. You may need to reduce your speed. Yellow and black temporary signs may be used to inform you of roadworks or lane restrictions. Look well ahead. If you have to change lanes, do so in good time. There may be occasions where other road users are unable to see your indicator, such as in bright sunlight or at a busy, complicated junction. In these cases a hand signal will help others to understand your intentions. Don’t force your way through if oncoming vehicles fail to give way. If necessary, slow down and give way to avoid confrontation or a collision. You will not be able to find a through route to another road. Use this road only for access. The sign gives you an early warning of a speed restriction. If you are travelling at a higher speed, slow down in good time. You could come across queuing traffic due to roadworks or a temporary obstruction. Road signs that prohibit overtaking are placed in locations where passing the vehicle in front is dangerous. If you see this sign don’t attempt to overtake. The sign is there for a reason and you must obey it. At some junctions there may be a separate signal for different lanes. These are called ‘filter’ lights. They’re designed to help traffic flow at major junctions. Make sure that you’re in the correct lane and proceed if the way is clear and the green light shows for your lane. If a police officer or traffic warden is directing traffic you must obey them. They will use the arm signals shown in The Highway Code. Learn what these mean and act accordingly. Buses and cycles can travel in this lane. In this case they will flow in the same direction as other traffic. If it’s busy they may be passing you on the left, so watch out for them. Times on the sign will its hours of operation. No times shown, or no sign at all, means it’s 24 hours. In some areas other vehicles, such as taxis and motorcycles, are allowed to use bus lanes. The sign will show these. Be aware that other traffic might still be clearing the junction. Make sure the way is clear before continuing. ‘No entry’ signs are used in places such as one-way streets to prevent vehicles driving against the traffic. To ignore one would be dangerous, both for yourself and other road users, as well as being against the law. This sign is found in or at the end of a one- way system. It warns you that traffic will be crossing your path from both directions. Ring roads are designed to relieve congestion in towns and city centres. In order to keep roads free from parked cars, there are some areas where you’re allowed to park on the verge. Only do this where you see the sign. Parking on verges or footways anywhere else could lead to a fine. You must comply with all traffic signs and be especially aware of those signs which apply specifically to the type of vehicle you are using. As you approach the lights look into the road you wish to take. Only proceed if your exit road is clear. If the road is blocked hold back, even if you have to wait for the next green signal. If you intend to stop and rest, this sign allows you time to reduce speed and pull over safely. A ‘slowing down’ signal will indicate your intentions to oncoming and following vehicles. Be aware that pedestrians might start to cross as soon as they see this signal. If you use the right-hand lane in a contraflow system, you’ll be travelling with no permanent barrier between you and the oncoming traffic. Observe speed limits and keep a good distance from the vehicle ahead. This type of sign will warn you of hazards ahead. Make sure you look at each sign that you pass on the road, so that you do not miss any vital instructions or information. The centre of the road is usually marked by a broken white line, with lines that are shorter than the gaps. When the lines become longer than the gaps this is a hazard warning line. Look well ahead for these, especially when you are planning to overtake or turn off. If you have to leave your vehicle in a tunnel and leave by an emergency exit, do so as quickly as you can. Follow the signs directing you to the nearest exit point. If there are several people using the exit, don’t panic but try to leave in a calm and orderly manner. Don’t attempt to overtake here, as there might be unseen hazards over the brow of the hill. Keep to the left. If other drivers flash their headlights this isn’t a signal to show priority. The flashing of headlights has the same meaning as sounding the horn, it’s a warning of their presence. Blue circles tell you what you must do and this sign gives a clear instruction to turn left ahead. You should be looking out for signs at all times and know what they mean. When traffic lights are out of order you should treat the junction as an unmarked crossroads. Be cautious as you may need to give way or stop. Keep a look out for traffic attempting to cross the junction at speed. As you approach a roundabout look well ahead and check all signs. Decide which exit you wish to take and move into the correct position as you approach the roundabout, signalling as required. Avoid blocking tram routes. Trams are fixed on their route and can’t manoeuvre around other vehicles and pedestrians. Modern trams travel quickly and are quiet so you might not hear them approaching. Triangular signs give you a warning of hazards ahead. They are there to give you time to prepare for the hazard, for example by adjusting your speed. Due to the dark colour of the road, changes in level aren’t easily seen. White triangles painted on the road surface give you an indication of where there are road humps. Don’t leave moving into the left-hand lane until the last moment. Plan ahead and don’t rely on other traffic letting you in. When traffic lights are out of order treat the junction as an unmarked crossroad. Be very careful as no one has priority and be prepared to stop. This sign is used to enable pedestrians to walk free from traffic. It’s often found in shopping areas. This sign indicates that overtaking here is not allowed and you could face prosecution if you ignore this prohibition. If you are driving a motor vehicle or riding a motorcycle you MUST NOT travel past this sign. This area has been designated for use by pedestrians. Make sure you learn and understand the sequence of traffic lights. Whatever light appears you will then know what light is going to appear next and be able to take the appropriate action. For example if amber is showing on its own you’ll know that red will appear next, giving you ample time to slow and stop safely. These signs indicate places of interest and are designed to guide you by the easiest route. They are particularly useful if you are unfamiliar with the area. We'll email you a different test each day for two weeks to help you ace your test.